Ray Puddifoot – Strong leader, aloof bureaucrat or poor communicator? Yesterday I highlighted a number of issues in Charville ward in Hayes surrounding potholes, flytipping and lack of grasscutting on the UKIP Hillingdon website. Because of the council website constantly flagging up ‘error’ when reported, I wrote the post and as stated sent a link through to relevant people by email to address the problems. Those people included the three ward councillors, the local MP, the councillor listed as being responsible for heritage and environment and the council leader, Ray Puddifoot MBE. 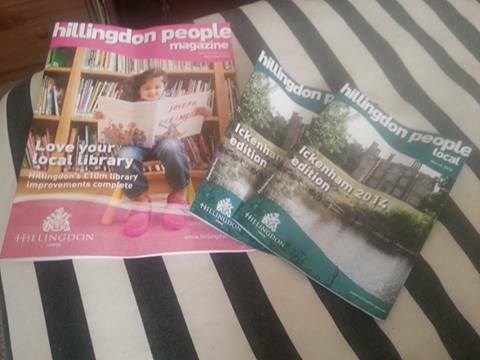 Hillingdon People Magazine – Town hall Pravda? Prior to this year’s local elections, we submitted a Freedom of Information request to the council concerning the cost to local taxpayers of the publication, and were advised that excluding staff working on the magazine as part of their wider functions (Who are therefore still being paid by Hillingdon residents on top) it came to £92,517 in the financial year 2012-2013. This year it is likely to be considerably more as special ward editions were also printed and distributed just before the election expenses period kicked in. So, what are we getting for our money? In the July/August edition, there were 20 mentions of Conservative councillors highlighted in bold across the 35 pages telling us all what a good job they are doing, compared to just eight for community leaders and members of the public. There were no mentions for any of the opposition councillors who represent the remainder of the borough or update of the work they are doing in their wards. It would appear that Secretary of State for Communities and Local Government, Eric Pickles MP, could have been thinking of Hillingdon when he coined the term ‘Town Hall Pravda’. Interesting too that when the Conservatives took control of the council all those years ago, they did so on a policy of scrapping the paper – In power, they have expanded it. UKIP policy in Hillingdon is to do away with this unnecessary waste of taxpayers money.